She stood beside the bed waiting for the next command, acting out her baker’s apprentice role. Her father sat in the bed, kneading the sheet on his lap into massive quantities of imaginary bread dough to be proofed in a big nonexistent wooden bowl, real sweat rolling down his face. When he indicated it was ready by pulling his hands away and speaking a few unintelligible words of Polish, she lifted the balled up sheet “bread dough” in both hands and took it away, turning to place it on the seat of the reclining chair in the cramped institutional room. He either approved or didn’t see what she’d done, she couldn’t tell, and he barely took a break before he began kneading another sheet into a ball. She had taken a guess this was what he wanted the first time he’d done this; he was speaking Polish, which she knew in only simple conversational phrases. He waved his hand and in an irritated voice said something that included the word mąka which she knew meant flour. Did he need more flour? Again she took a guess and picked up a bed pillow and carried it over to him, setting it on the bed beside him. He picked it up and poured imaginary flour from it, so she guessed, then put it down and went back to kneading the bed sheet. He wasn’t strong enough to support himself walking, but his muscles were rippling as he vigorously kneaded the sheet. What was he seeing? She was fairly certain he was not seeing this room with those glassy, feverish eyes. Her father’s eyes were hazel and soft, but these eyes were squinted with effort, then glaring sharp and black with his dilated pupils when he looked at her and gave his order. Probably a medication effect, but who knew? Dementia was a strange thing, the doctors and nurses had said. You never knew what you were going to get, or for how long. It was hard to tell if they were “in there”. She had had her introduction to this mind play a couple of years ago, the day she had driven him to the hospital, on the last day he’d ever spent in the house she’d grown up in. As her mother sat before her vanity back in the bedroom putting on makeup and brushing her hair, getting ready to leave the house, she had been in the kitchen with her father. This was not at all unusual, but the conversation was. Her father had stopped conversing years ago, speaking one or two words in answer to questions but never sentences, and certainly not initiating talk. He had been diagnosed with Parkinson Syndrome a few years before that day, and the discussion of symptoms and effects had pretty much explained the silent, shuffling, stone-faced father she’d grown up with. Now, with medication for the condition, he talked all the time. He didn’t know who she was. And in the two years following that day he seemed to be moving steadily backward in his life, discarding memories as he went. She was the youngest child, and he was now back before the time she was born, some time in the late 1950s when her brother was a toddler and her sister in grade school, they had just moved into that house, her mother was still young. Since then her father had forgotten Allen too, and then her sister Ann, though he seemed to hold onto his memory of his wife. Eventually even she slipped away to reappear unexpectedly as he moved through the war years when he’d been a cook and baker in India, the years during the Great Depression when he’d worked in the family bakery, jobbed around as a musician and picked up any odd job he could find. The bakery had been the family business. His father had brought it in his head from Poland and built a family bakery, not on Main Street, but in a poorer neighborhood where people really needed the bread and would buy from an immigrant. The bakery had done well and her father, first born, had nearly been born in the bakery in the years when his father and mother were just starting out. Then he had worked in the bakery from a young age before and after school. After the banks had failed in 1929 and so many people were unemployed, hungry and losing their homes, they kept baking bread and just gave it away if people couldn’t pay for it. In 1931, at age 12, her father left sixth grade to make bread and pastries and drive the delivery cart, pulled by a pony that belonged to a neighbor. They lost the bakery in 1936, and her father along with his father and brothers looked for any work they could get until 1941, when the Japanese attack on Pearl Harbor made the World War broadcast on the radio, like a serialized daily drama, reality for Americans. The brothers enlisted, all were lucky to make it safely back. The family bakery was never resurrected. When he had begun this wild bakery activity, giving orders in Polish and sweating real sweat, her sister had been in the room and called her to say she was probably the only one who knew what he was doing, and maybe even knew some Polish. His family had spoken Polish at home, and though they also spoke English he didn’t speak it regularly until he went to school, and spoke both easily all through his life. But on the rare times he spoke now it was only Polish, his sunken soft hazel eyes wandering in confused silence otherwise. If her guess was correct about him marching steadily back in time he’d be a teenager now, or even younger. She’d tried to pull out a few Polish phrases but he didn’t even respond to that. He just kept kneading sheets and sweating, seeming angry. Wow, she thought, he really hated baking, he wanted to be a musician, and here he’s stuck baking in his hospital bed…until he dies? She looked at his gnarled hands and veiny arms, thin from wasting with this disease, his back hunched from decades of bending over the bench, those dark, piercing eyes that were not his, and wondered what he did see. It wasn’t this room, it wasn’t her. What part of her father’s childhood was he inhabiting now? The bakery just below street level was dim and hot with the fire to keep the ovens going, stuffy with the rain. The street was at eye level, the cobbles a glistening bumpy pattern. A waft of cool damp air drifting down the steps to the open door cooled his face momentarily, but the sweat still dripped from his nose and chin, ran down his arms from under his shirt. Maybe the heat and rain would make the bread proof faster and he could get out of this place before dawn and hide somewhere to sleep. They treated him like a servant and barely let him eat. He was supposed to be an apprentice, learning the trade, and he had learned it alright. He seemed to have a talent for it that even he had never known. But this couple had stopped baking since he had started, taking care of the shop and traveling around town to sell even more so he had to work even harder, never giving him credit for the increased quality of their breads and pastries, and or course he was unpaid. He had been glad to get away from his drunken father who roared and swung a meaty punch toward anyone who came near him. His oldest brother wasn’t scared of their father and would take over the smithy. His other brothers had gone off to be soldiers and had no idea if they’d ever return. His sisters stayed with his mother and each vowed to take her with them when they married. His father had told him to go to the baker, who had no children, that would be his trade. That was it, just leave, walk across town and go to live with strangers. As the youngest son, he knew it was taking a trade elsewhere or being a soldier or sailor, and so he went. He had been glad at first, until in a year they barely let him out of the bakery, no more fun, no more education, he couldn’t even finish schooling and would be trapped, working in their bakery until they gave it to him or died. He didn’t say much about it, didn’t talk to much of anyone, he just seethed and kept it all inside. He had heard customers talking about people leaving Poland, leaving all the countries in Europe for a new country, full of other opportunities, sailing for months to get there. He hadn’t had much school, but he had seen maps, checked them when his brothers left for the war, checked them again when people mentioned this “America”. He couldn’t even comprehend the distance, a boat, total strangers, and didn’t even think about speaking a different language. Yes, the heat and moist air would raise this bread to perfection. Yes, he knew his baking, good enough to have his own bakery, which would never happen here. He finished kneading the bread dough, rolled it into the proofing bowl, pulled together his shoes and his coat and cap, walked out the door and squinted his dark eyes into the drizzly night, and headed west, toward where the English coast was on the map, where a ship would take him to that new land, where he could claim the success and the life that would be his. This story is mostly true. The father is my father, and I was the apprentice baker in his room in the nursing home. We had that conversation, he did seem to move backward in time over the years, and he did make bread of his bed sheets. And he did have those frightening eyes that, for all my father’s distance through Parkinson Syndrome, I never saw at any other time in his life. I also never forgot him sweating in his very real bakery. I have been working on researching my family history. Years ago when I began I could not find my father’s father anywhere. I barely knew him because he died when I was quite young, but my fiction writer’s mind was putting this story together even then, thirty years ago. That part of the story is fictional. I resolved to at least draft the short stories I’ve been carrying around in my head all these years, just to see if they actually work and to get into the habit of writing them. I am slowly working on a few, but this one practically wrote itself in the first draft with two rounds of rewrites. I hope I can keep it up. You can read this and other stories in “Short Stories”. Her tears, somehow cold as they emerged, mingled with the melting of snow that relentlessly pelted her face as if to add volume to the fountain that poured forth from her swollen eyes. Her face was numb in the blizzard wind that scoured her bare skin in the frigid night, turning the tears and melted snow to ice on her chapped cheeks, constantly scraped by the glassy crystals that swirled around her head like angry bees before finally embedding their sting into her skin. She visualized her face as the smooth pale marble of a statue of some unknown saint in a church courtyard, an eternally sad and enigmatic expression in her colorless, sightless eyes, the carved lids and cheeks slowly gathering snow yet pocked with tiny droplets of blood where each crystalline snowflake had broken through the stiff skin. It had all become so surreal she played with the idea she was actually dead and hallucinating this walk through the woods as some bizarre after-life travel through a tunnel toward “the light”. But even though she could barely see through frozen lashes, and the pain of snow crystals forced into her eyes when she tried to open them further, she knew there was no light ahead in this tortuous place, no end of the tunnel of trees rising on either side, their canopy above, the views ahead and behind obscured in the blizzard haze, and her other senses dulled by the persistent hiss and scraping and numbing cold of the storm. It was as if she walked in a bubble of her own suffering, made worse by a few falls into the deepening, drifting snow that chilled her to waves of uncontrollable shivering and obscured her footsteps, and the smooth path of what she dragged behind her. She had thought to follow her path back if she felt in danger at any point, despite any consequences, but as if to mock her the storm had worsened quickly as she traveled, its force not even broken by the dense woods, and closed in around her. Though these woods had often been a refuge, the isolation created by her dulled senses and deepening cold had made it unfamiliar and hostile. Fear began to push aside the veil that blinded her senses as she slowly acknowledged the reality of her situation. She stopped, caught her breath, tried to still her shivering and looked around, trying to focus on objects, rocks, trees, things that were solid and tangible, trying to find a familiar pattern that might identify where she was in the woods. The wind and snow pressed against her, forced into her eyes and nose and mouth, invasive, almost smothering, even when she turned to face behind her, away from the wind. Is this real? Am I freezing to death? Was her life really in danger? What had she done? None of this was what she’d intended. 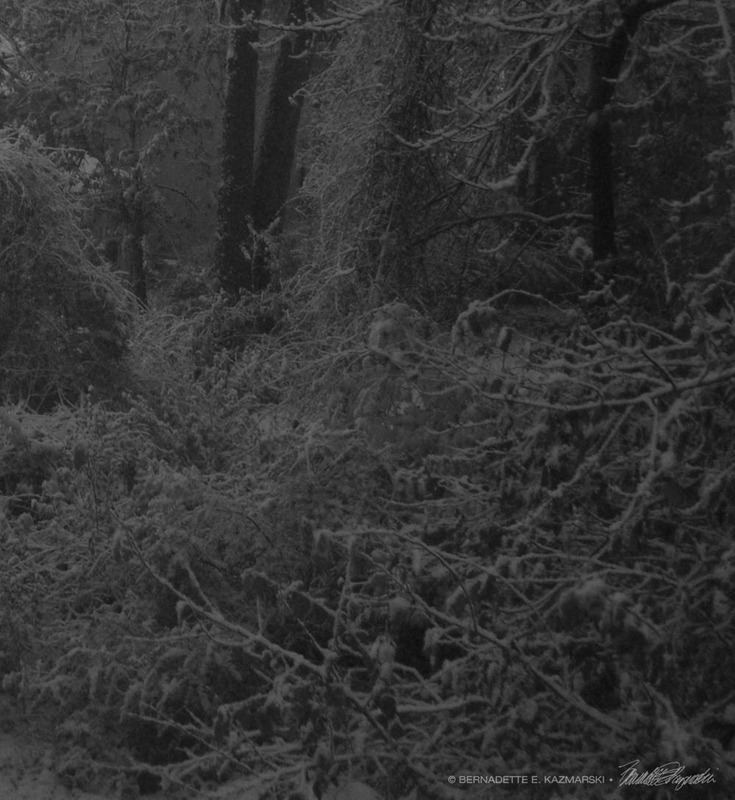 She knew it would be risky at night in winter to begin with, but she knew these woods, even with paths covered in snow because their shape was easy to find as they wound clearly among the tree trunks, free of brush. Animals also trod the same paths, those familiars with whom she felt a kinship as she walked, alone, for that welcome respite of solitude and silence. She had often wanted to simply stay once she’d entered the woods and shed the cacophony of everyday life, feeling the relief, breathing more easily, smiling, feeling graceful and balanced and in time forgetting her own self, simply feeling a member of this woodland community, even in winter. But that familiarity was not true knowledge. She only knew what she enjoyed and found familiar, not all that was there, and certainly not the woods in a life-threatening blizzard. I got myself into this. I knew I didn’t really know the woods. I walk everywhere in all weather, but not in the woods. I should have known I wouldn’t be able to handle the weather and finding my way. Was it really worth it to take a shortcut through the woods because I didn’t want to walk all the way around on the streets, even though I was leaving later than I’d intended? Am I going to die in these woods tonight because I had to get this rocker out of someone’s trash pile and get it home before the storm hit? This short story was a submission for the Winter 2016 Writer’s Weekly 24-hour Short Story Contest. You sign up ahead of time, and on the day and time the countdown begins, always a Saturday, the page on the WW website that includes the topic goes live and entrants get a link in e-mail. I actually won a sub-award, one of 15 door prizes. I don’t remember the topic exactly and didn’t copy it down, but I do remember that in it the person was dragging something through the woods at night. You don’t need to use the exact text or even the scene described, just use it as a starting point. The instructions said they liked surprise endings. With my recent experiences outdoors in sub-freezing temperatures and musings on the tenuous nature of life, I thought I’d share this story this Sunday. Several years ago I was driving home on a Christmas night, traveling along a dark two-lane road in a somewhat rural area that was familiar and fairly close to home. As dusk fell the light dusting of snow around me was tending to violet and the perfectly clear blue sky above me was also shading to violet in the east. As I turned a bend in the road I met with surprise a big bright and creamy full moon that had risen above the uneven line of pine and deciduous trees nearly silhouetted against the sky on the horizon. I smiled at the pure beauty of the scene and as I drove along, the moon seemed to follow me on my left. I had just driven first my brother back to the nursing home where he was living while recovering from a traumatic brain injury, and then my mother, who was living in personal care in the after effects of lung cancer and congestive heart failure. I had cooked a Christmas dinner at my house, set everything aside to keep warm and gone to pick up each of them. We ate our dinner and I packed a few leftovers for each of them before getting them back in time for dinner medications. Now I was on my way home to pack up the rest of the dinner, wash dishes and clean up my kitchen. Deep in thought about these two and about my own life since they’d suffered their illnesses, I considered our day then moved to other Christmases, other holidays, other family members, other homes. In my distraction I slowed down with the rises and falls and bends in the road in the growing darkness, but was still aware of that full moon following me out of the corner of my eye. A small valley opened out on my right, a familiar thing to one who walks the woods and valleys in Western Pennsylvania: a level area filled with young trees, scrub and brambles which had recently enough been the rich bottomland field of a farm, bordered by a narrow stream, and behind that a rather steep tree-covered hill. These small valleys appeared on both sides of the road, and with a little traveling the valley would rise up into a hill that bordered the road, up and down, the road, the landscape, the rhythm was comforting, like rocking slowly in a rocking chair. But as I passed this little valley I noticed movement. I knew it was probably just a deer as this was the time of day they moved about and that was the perfect area for them to be having an evening meal. Though I hadn’t been facing that direction and didn’t actually see anything directly, the movement hadn’t seemed to be a deer, it had seemed human to me. That was not a problem, really, the little valley was essentially someone’s back yard and it would not be unusual for them to be walking around there even on Christmas, but something about the figure had also seemed familiar, I had no idea why. Even though I wanted to get back home and clean up my kitchen, I slowed down and pulled to the side of the road. If there’s a possibility, I like to pursue these little ideals that arise, stopping to explore, but I rarely have time to. I had passed the valley so it was now behind me, but I backed up along the berm of the road to a spot where I could see the valley. That silent pale yellow moon still shone on my left, risen slightly higher above the horizon than before, shone directly into the little space, lighting the snow cover to a pale silver violet and the tree trunks to varying shades of pale gray against the charcoal-shadowed hill in the background. Everything seemed still, but I detected movement flitting among the trees, thought I saw the glint of moonlight on hair, on an arm, a dress. I opened my car window and shut off my radio and then my car’s engine. If those were people moving down there, they should be crunching in the snow, but I heard no sound in the crisp, clear air. But I felt such a strong presence. Quietly opening my door and standing up in the bits of snow and gravel at the edge of the grass along the road, I heard only far off sounds, a plane in the sky, a car traveling somewhere, a dog barking. The air was so clear I thought I’d hear sounds from miles away traveling quickly through the cold, windless darkness, leaving little virtual contrails as they moved through the infinity of a cold winter night, but nothing came up from the valley, neither from hooves nor feet. And if I was reading this and didn’t know the story I’d be yelling, “You idiot! Get back in the car!” No, this isn’t going to turn into a made-for-TV movie—you are safe to read on without fear. I am cautious and always aware, but didn’t feel in any way threatened, in fact I felt safe and welcome. As I stood there, one hand on my open car door, I thought I recognized one of the figures out of the corner of my eye, and as it is with focusing on subjects in near darkness the figure disappeared when I looked directly at it. But I knew it was my mother, walking quickly and gracefully as she had done when young, laughing soundlessly over her shoulder before disappearing into the darkness. Then I saw one of my aunts, also laughing but in a conversation with someone else, happy for once in her life. And as I stood there I saw other relatives, my brother and sister, aunts and uncles, even ones I’d never known and only seen in photos, just a few seconds each, and all were happy and laughing and moving here and there, the little valley was full of these specters. Then I realized that each of these were the people I’d been thinking about as I drove along. Had I manifested them? Was I hallucinating? I hadn’t even had a glass of wine yet, waiting until I was back home in my warm kitchen in my stocking feet and wearing an apron, washing my dishes and singing along with the radio. But here they were in this magical little valley and what had made me slow my car, had drawn me out to experience it was the joy in the scene, they were all enjoying themselves, happy and laughing, something that had not always been so in real life. Here they all were together in this little parallel universe. No, I had been thinking so deeply about them all, remembering where I had memories or simply imagining those who I’d never met. When I create a scene for artwork or writing I visualize it pretty completely and for a while as the goal of my work it is very real to me. In that manner of visualizing, in that dusky time of day when I feel the veil of reality thin and the closeness of those who aren’t with me along with that magical moon and its light among the trees, my thoughts for those brief seconds became real, and I saw them as I wanted them to be, or perhaps as they really were without the worries and weariness of everyday life, happy to be together. The little girl cat waits for her chosen person to appear. After cold rain and the first snow storm of the season, the temperature began precipitously dropping and at night we had a snow shower, then a dark, cold, wet day that reminded me of a day in this story. The actions in this story occurred in late November, right around Thanksgiving, so I always share it some time during Thanksgiving week. It’s a sweet story I’d carried with me for nearly 20 years and I’m not sure of the exact year, probably 1993 or 1994. 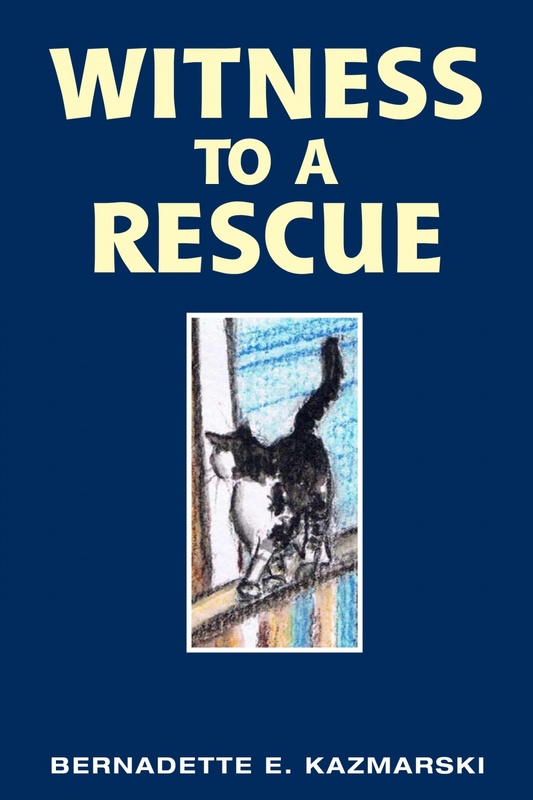 It’s included in my series of rescue stories even though the rescue is neither mine nor is the cat one who came to live with me, but I still feel very connected for having witnessed it, and knowing that small kindnesses like this happen every day, everywhere, and need to be noted. At the end you’ll read more about the story itself and the illustrations. I also have it available for Kindle and various other e-readers, and I also have an audio version that I recorded so you can listen to it too! Please enjoy this act of kindness in any form you please. I’m thankful for all of you as my readers that I have an audience for my creative efforts. A little tabby and white kitty had joined the varied clowder that roamed in the back yards, often leave-behinds from renters who moved on without their feline housemates. As the brilliant leaves fell from the trees and brush between our yards I noticed her bright white legs while she hopped uncomfortably about like a bunny on the detritus of summer now sodden and brown with November rains. I saw her again a day or two later when the rain had stopped hours before and the weather was quite nice for early November. She was obviously not accustomed to being outdoors, and far too clean to have been outside for long. I noted the direction she was walking and went outside to introduce myself and assess the situation. Was she an indoor-outdoor kitty taking a walk on the wild side, was she a leave-behind, was she lost? Why didn’t they come with a little note hanging on their collar? I knew I always risked “rescuing” a cat who belonged to a neighbor so I got to know as many as I could; this little girl was unfamiliar. But I was too late to catch her. Before I even left my deck I saw her purposefully continue across the neighbor’s yard directly behind mine to the house next door to that, a four-apartment rental. She trotted easily up the steps to the porch at the back of one of the second-floor apartments as if she belonged there and greeted the woman who was sitting on a chair, reading a book. I heard a faint “meow” and saw her rub against the woman’s legs and then jump up onto her lap. I knew the woman as another cat owner who had lived in that apartment for at least two years. She had a little black and white kitty who always sat in the west-facing windows of her apartment in the afternoon and evening, dozing in the sun. I had spoken with the woman a few times about cats in the neighborhood, inquiring if she had ever seen them or knew who they were, but we had never exchanged our names or our cats’ names. She never minded discussing our neighborhood cats but seemed to want her privacy and anonymity, and I understood her need to be able to step outside on her porch and read a book without being interrupted by a neighbor unless it was absolutely necessary. Finding out information about a lost cat was apparently a necessary conversation. Was the tabby and white cat her cat? But she had insisted she was a one-cat person, and that her cat never went outdoors. I doubted that this cat was hers unless she had had a big change of heart and decided to keep an indoor-outdoor cat, and if that was the case, I doubted she’d be ignoring the cat’s fervent though wet and muddy greeting. The woman does her best to ignore the girl kitty’s advances. And she was doing her best to ignore it, putting the book between her face and the cat when the cat got between her face and the book, gently picking the cat up in one hand and placing her on the wooden floor of the porch only to have the cat leap nimbly onto the arm of the chair, then onto her shoulder and walk around behind the woman’s head. 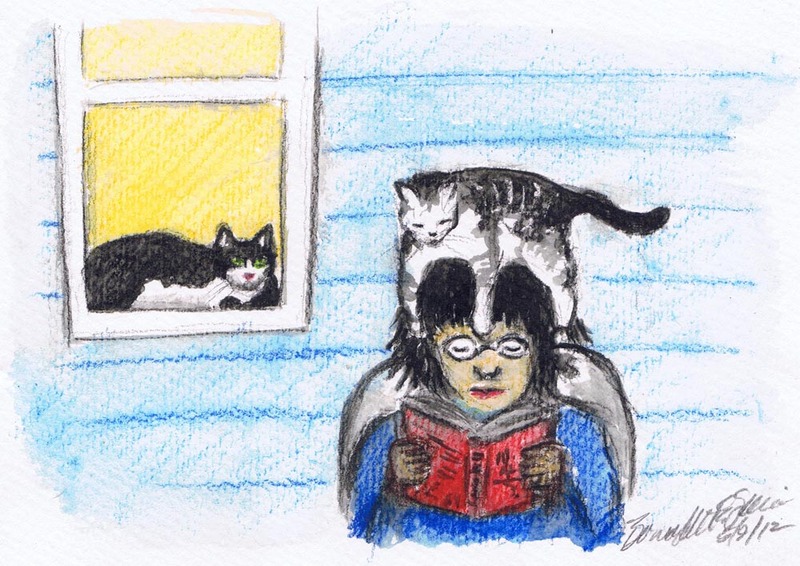 When the cat got up onto the woman’s head, trying to keep a footing on her hair, the woman patiently put down the book, picked up the cat with both hands, and set her on the porch once more. Her black and white kitty was in the window right next to her, watching everything. I had walked across my yard to the corner where I was a relatively short distance away from the second-floor porch, and things were not so overgrown then. I gave a hearty “hello” as the woman was setting down the cat and the woman looked up at me and waved. I asked if the cat was hers and she said it was not, but that it had been coming to visit her when she sat outside to read. She had no idea where the cat had come from and it had not been around for long; it was the woman who identified the cat as female. I told her the cat had every intention of being adopted into her household, and the woman said the cat was very nice but reiterated she was a one-cat household and was sure the cat belonged to someone, she was too nice not to. I thanked her for her time and decided just to monitor the cat’s activities and ask a few of the neighbor kids if they knew anything about her. Over the next couple of weeks I saw the cat a few times, not always heading from the same direction as if she was wandering, and looking a little more tattered each time. I would stop her and offer food and she ate it hungrily but always continued on to the woman’s porch. I remembered that we’d first seen her at the beginning of the month and it seemed someone had likely left her behind when they’d moved, intentionally or not. On warm or sunny weekend days the woman often spent a hour or so outside with her book and the kitty happily, a little desperately, perhaps, laid on the affection, performing metaphorical kitty headstands for the woman. When the woman was not outside the cat would stand on the railing of the porch, long legs straight and tail in the air and look in the window, or stand up and slap her paws against the wooden screen door, or sit on the woman’s chair. The black and white kitty would lie in the window, squinting and impassive. Desperate, girl kitty simply clings to the screen. On yet one more rainy day later in the month as I was working in my kitchen I saw the kitty on the porch and somehow, from that distance, felt her desperation. 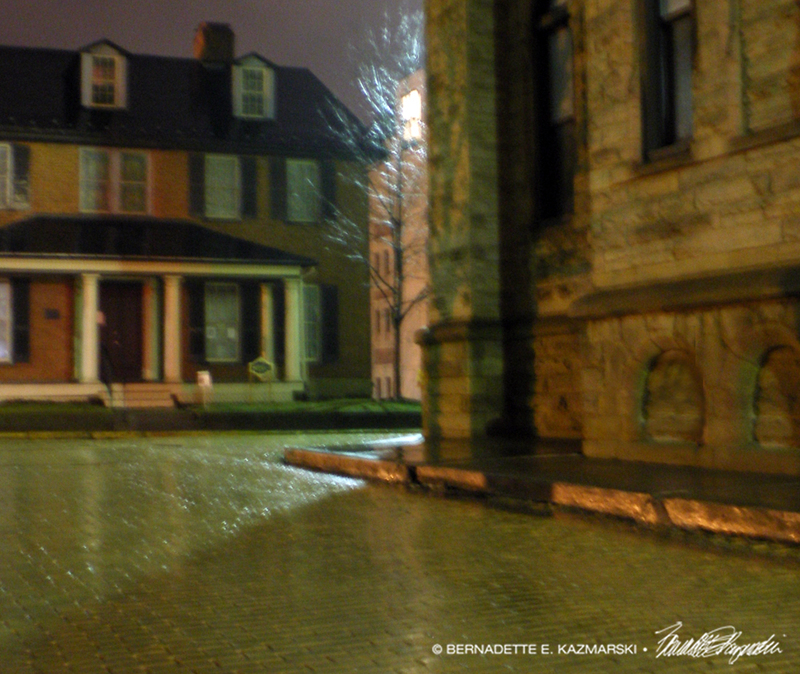 It was a cold and dark Saturday, slipping back and forth from rain to sleet and even a few wet snowflakes now and then. No little explorations or visits to my yard, I could see her legs were muddy and her fur clumped and wet. She hopped onto the railing and walked back and forth, meowing, then jumped onto the chair, stood up with her paws on the sill and looked in the window. 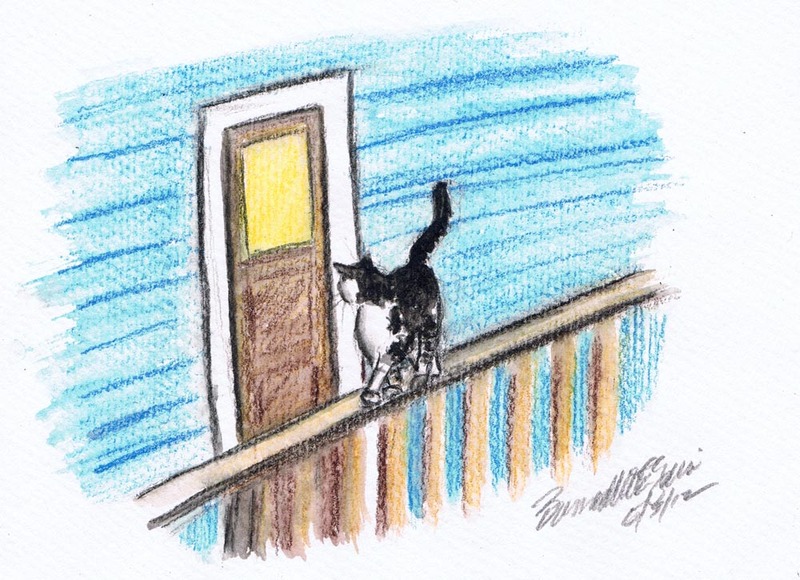 As a last measure of desperation, she climbed the screen door so she could see in the window of the interior door and clung there at an angle, meowing. I saw the interior door open and light shone onto the porch. The screen door slowly opened far enough for the woman to come outside, put both hands around the cat’s torso and gently remove her from the screen. The woman opened the screen door and disappeared inside holding the cat. I watched the screen door close behind her, then the brown interior door closed leaving just the yellow square of light. I had just witnessed a rescue, but who had rescued whom, only time would tell. This is a true story, from the early 90s, written in 2012. I’ve remembered it all these years because I was so moved by the growing relationship between the woman and the cat. I never did find out where the cat came from, but I don’t think it mattered because she was apparently meant to be with my neighbor. I never got to know the woman any better, respecting her privacy. Better to keep good relations with neighbors in the first place, and people set boundaries for a reason. We spoke often enough that if she had wanted to be more social she had the opportunity. If not for the cat’s insistence on being part of the woman’s life I probably would have taken her in long before that, giving her veterinary care and fostering her to find her a new home, as I did with many cats in similar situations who showed up in my back yard in those days. I will add that when I watched her peel the cat from the screen and take her indoors, I simply started to cry. I have no idea if she kept the cat or not because she moved soon after, but I think the cat finally convinced her that she belonged with the woman. These sorts of rescues often have a touching or dramatic back story, but that part I can only guess. But I also had these illustrations in mind all these years as well. This apartment building is still there, still blue, still has a deck with doors at the backs of the apartments and two cats who live there; I think of it every time I look at the building. I’ve always wanted to share this story and the images I’d visualized all those years ago; now I have the opportunity. I’d intended all along, from the time I witnessed this rescue, to write the story and illustrate it, and so I did in May 2012 to celebrate officially moving The Creative Cat to a self-hosted platform so I could offer my work in many more formats. 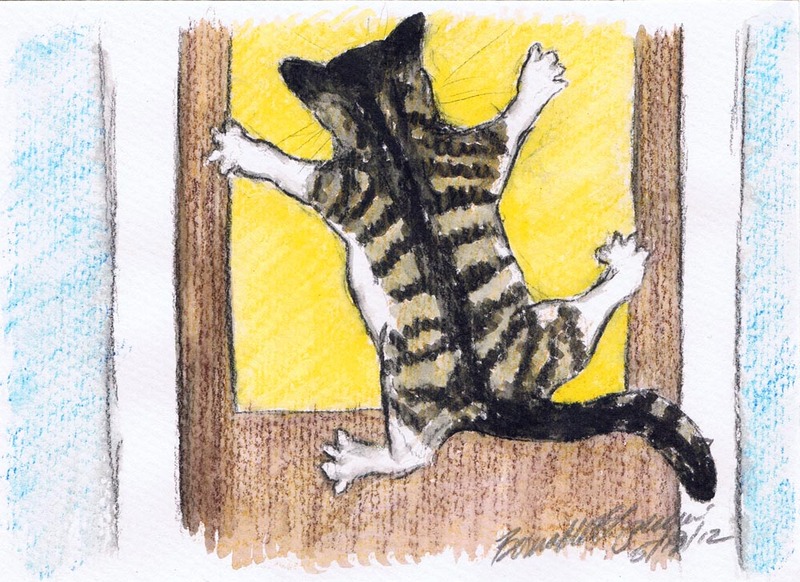 One of the reasons for my Daily Sketches has been to practice, just practice—sketching my cats in various poses and activities, working in different media and different styles; through this I grew to enjoy working with watercolor pencils, which is the medium I chose to use for these illustrations. The daily sketches are experience in working quickly from life, but I also want the experience of working with a visualized image with no live models, though I’ll admit I did stretch out Jelly Bean to get a better idea what the kitty would look like clinging to the screen. Illustrating one of my stories gives me this experience in working from a visualized image. I’ve also been learning to design and format e-books for my own sake and professionally—I’m a designer, I had designed books for two publishers years ago, this is another exciting skill to learn and to offer to commercial customers as well as for my own writing. This book is available on Amazon.com, but I’d love to share it with those of you who have electronic readers of any sort. At the end of this article I have links to electronic files for download. So please read the story here and download it if you can, and let me know what you think! Read a review by Ingrid King of The Conscious Cat. The cover design is for the e-book, and I’ve never been really happy with it. One of these days I’ll actually publish it in a small volume and create the cover I want. I don’t have any e-book devices but I can read them on my computer. I use both Kindle Previewer and Kindle Cloud Reader to read books intended for Kindle, and a program called Calibre to read e-books in other formats. Most electronic readers can open an EPUB file. Kindle readers work best with a MOBI file. Download it as a PDF. And for the 2016 anniversary of sharing this story, I finally recorded it. Some day I’ll have to get a real microphone so please pardon a few little blips, but I enjoyed reading it with you listeners in mind. Click here to see the video on YouTube, or watch it below. and read about my Rescue Stories series on The Creative Cat. 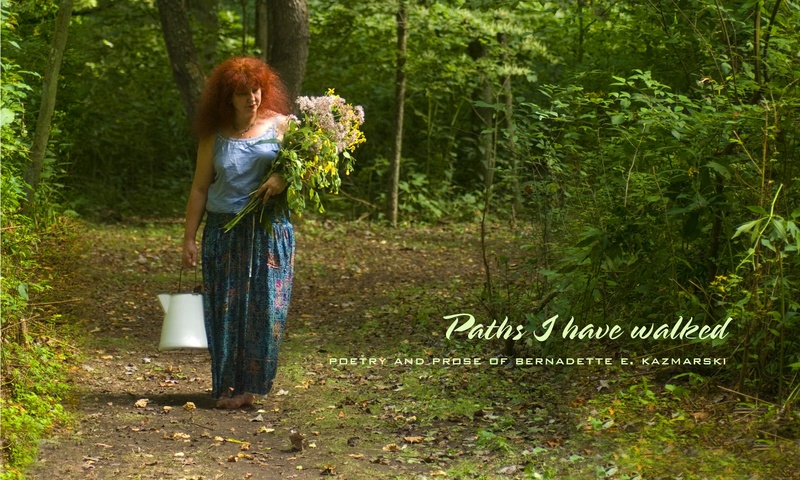 Also find other recorded works as poetry, and visit my YouTube page for all my videos and recordings. I’m very excited to have finally recorded this after years of thinking about it. It’s really my beginning plan for recording all my books, and this one I’ll expand to include other stories I haven’t yet written about. But to do that I’ll need to purchase a better microphone and a quieter chair! Between that and printing and the time it takes to create these things, so I’ve set up a Patreon page through which patrons can pledge a certain amount each month to support these projects. You can read about it here or visit my Patreon page. The morning’s session had gone very well. Leaping aboard her little boat, she clamped her painting onto the easel so she could study it while she washed up and had a little bit of lunch, then she’d get right back to work on it while her thoughts were fresh. 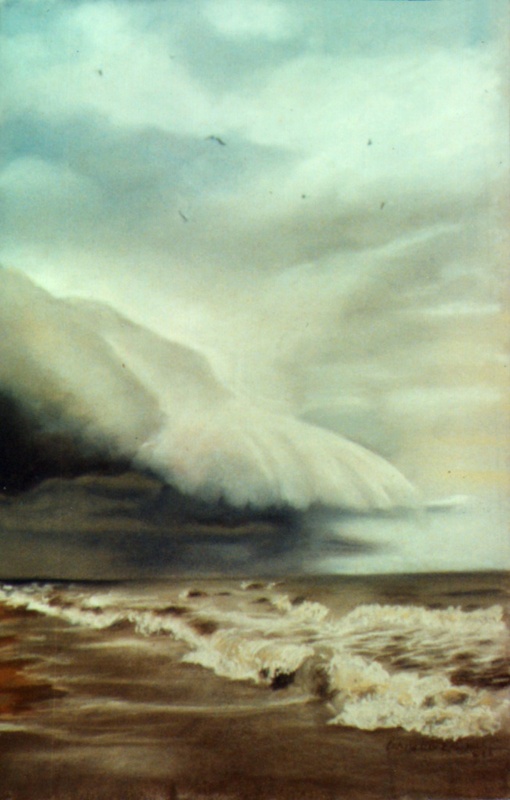 The painting was a large pastel depicting the first tinges of an incoming autumn storm, and though the morning had been hot, the sun cooking her arms and legs and reflecting from the sand up under her hat to dry her face as she stood on the beach, she had felt the first twists of a breeze from the storm, still miles away, coming across the continent to bring autumn from the mountains to the shore. Even the light was changing, dimming just a bit as a thin haze washed onto the blue of the dome overhead like the foam of waves washing onto the beach, the entire palette moving from summery bright blue and warm yellow and white to amber and olive, the ocean darkening to teal. This was what she wanted to capture in her painting, that moment of change, and that was why the painting had to be so big. She wanted to capture the subtle change across the sky, the dimmer tones inland and brighter tones over the ocean, the first choppy whitecaps, that pathos she had always sensed when autumn crept across the palette of the land, whether in the eastern hills she had known and loved, or the shoreline she studied now. Even the heat on her skin, the flush on her face, and how cold those tiny tendrils of cool breezes had felt on her skin, those had to be in the painting too. She set up her palette of pastels on a table next to the easel, pulling the colors she knew she wanted to the front and arranging them in the way her hands knew best without the need to look down. It was good to come in when she had, even though only the intense heat had made her stop and come in for cover. She had reached that point where she was in her painting, the point where she had to leave the reality of the physical place for the surreality of the inner place, to interpret her senses and the deeper emotions she felt but could never verbalize, only paint. That was what made her paintings different. Viewers could sense the place, and not just enjoy the view. And this was why she had won the painting contest, and this little painting vacation to visit and paint in the space of her choice without interruption. The chance to be so totally focused on her work was a rarity in her life as an artist, filled with clients and shows and costs of materials and art festivals and getting the car fixed not to mention the commercial design work that actually paid the bills. This week was the chance of a lifetime. And it was the perfect time of year too as there was no one on the beach to interrupt her focus at this time of year. She stood back from the easel and sat down to focus once more, thinking of the empty beach, devoid of tourists in early October, adding to the sense of desolation—this beach recently filled with colorful, noisy people enjoying their time away at a place they loved, suddenly silent and the storm inching its way across the sky, sly, quiet, no thunder and lightning, just that change in light. Suddenly she heard a pounding on the door. Startled she looked about and realized she was on her boat. She had thought she was on the beach still, painting. She stood up and noticed the light was odd. Had the storm come up that soon? That pounding and yelling—was someone on her boat? She had been tied to the dock, that wouldn’t be hard to do. But she had fallen asleep–what time was it? She couldn’t see very well—was it night? She fought her way to the door, past her painting, hoping her pastels didn’t land all over the floor, she got to the door and tried to pull it open but it was locked. How to unlock it? That knocking, it was so confusing! “Are you okay? Hey, Bernadette, please answer!” Pound! Pound! Pound! Who knew her name here? Who was this? She suddenly didn’t want to open the door at all, and her grasp of where she was seemed to be fading. Then she saw seemed to snap back to reality and recognized…her studio? At home? In Pennsylvania? What? And the person at the door, it was Michelle. What was happening? This short story was a submission for the Spring 2016 Writer’s Weekly 24-hour Short Story Contest. You sign up ahead of time, and on the day and time the countdown begins, always a Saturday, the page on the WW website that includes the topic goes live and entrants get a link in e-mail. You don’t need to use the exact text or even the scene described, just use it as a starting point. I was kind of lost with the context of being on a boat because I’ve never been on a boat on the ocean, really just a riverboat here in Pittsburgh, or a canoe. I remember the word count was between 800 and 900 words. I spent some of those precious 24 hours thinking how the heck I was going to be believable in writing about being on a boat on the ocean when I didn’t feel I could imagine it clearly enough, and decided I’d focus on being in the ocean or on the beach, which I could imagine. Quickly I leaped to painting, and then to the painting I included here, one of mine from 1993 after my one and only visit to the beach at Chincoteague Island, VA, as my inspiration for why I was on a boat on the ocean. As I wrote, the whole idea of the painting itself, the painting contest and even falling asleep, just fell right into place because I knew I’d easily fall right to sleep after being out in the sun on the beach painting for the morning and then wake up disoriented. It turned out to be great fun, and I remember that I got down to the last second to submit because I didn’t remember I had to reformat basically without formatting so that no special software was needed to read it. I didn’t win anything, but I liked how it turned out and I’m happy with it nonetheless. The dusk deepened as she walked up the winding trail through the trees. 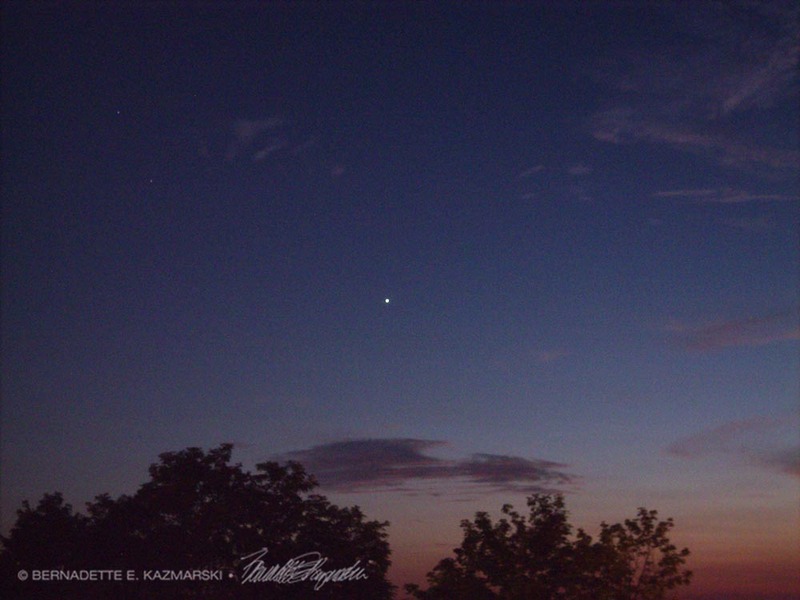 At the top of the hill, at the edge of a clearing, a cliff with a steep drop to a river gorge created a break in the woods and allowed a view far into the distance, and there this dim dusk among the trees would brighten again to the last light of a summer evening, coloring the sky and clouds overhead in warm shades from coral to cobalt. She had discovered the lookout while hunting, and visiting this place to watch the sun set and the stars appear had become a comforting routine for her. This time of day, the progression of the sun to the horizon and slipping below it, the gently deepening darkness and the animals preparing for sleep or beginning nocturnal habits, was so much like home that she could forget she was in a new place. Visiting, and frequently, eased the deep sadness that she would likely never see her home again. Adjusting to the differences had not been so difficult as she had thought. In most ways this place was just more primitive, which they had known and prepared for. They’d all had to rely on a combination of the anthropological history they’d learned and survival skills some of them had picked up by choice, enjoying breaking free of the highly technical rigors of modern life to walk away from it for a while. Ironic, too, how many of them had learned their survival skills in professional team-building sessions, never knowing they’d end up using the primitive skills as much as the team-building. Reaching the top, she walked to the edge and stood, her gaze scanning slowly from one side to the other, rolling over the panorama, stopping briefly on recognizable elements in the landscape, their little settlement, a particularly large tree, a small stream, then lifting her gaze to the sky around and above her, looking from the brilliance of the early sunset to the deep blue on the opposite horizon. The day had been hot; this new climate was challenging. The cool touch of the evening breeze now brushed past her rising from the valley below, ruffling the tall grasses like a playful hand and sifting through the trees beyond, refreshing and relaxing her, the open space soothing as she stretched and breathed deeply the rising dampness of the coming night. This time of day had always been pensive for her, and finding this spot had given her the place to go to review the day. Nearly a year had passed since they’d landed here, and on the day they’d arrived the evening had been much like this, so much like home that she had felt welcomed, and buoyed with hope that they had done the right thing. Four seasons had transpired, slipping one to the next much more quickly than they were accustomed to, but they’d still had time to prepare shelter and food and adequate clothing. In that time they’d honestly managed to pull together as a team and build a small community, a fact which, upon reflection, had surprised many members, thinking they were already a tight group. A shared need for survival can either bring people together or put them into competition with each other. This first year had brought out talents, built relationships and formed leaders, though not without hot debate and some raised hackles now and then. Only three members had been lost to accident. Learning to function in the wilderness none of them were accustomed to, these deaths had been difficult and frightening and brought a big dose of cruel reality to their experience, but they had managed to hold together, grieve together and bury their dead together. There had been a two natural deaths, too, a cancer none of them could do anything about in this primitive place despite all the modern tools and medicines they had packed in preparation, and heart disease left untreated by medication no longer available, a frustrating predicament for people as advanced as they had believed themselves to be. Only one person seemed to have snapped from the stress of it all, and he had angrily decided to leave the group, packed as many provisions as he could carry, and took off following the river. He was angry because no one was willing to explore beyond a day’s journey and look for civilization in this place, other people, cities, modern conveniences rather than sitting and waiting for death. He was the only truly single person in the group and determined this was his role because he’d leave no one behind. His outburst had come about after one of the accidents, a horrible fall down a cliff that had left one of the women paralyzed but screaming in pain, and all they found they could do was sedate her and keep vigil until they determined it was time to use the euthanasia drug they had brought with them for instances like this. It was true, before that accident they had been approaching the whole thing as an adventure, as if it was one of their team-building wilderness sessions that would soon be over with assistance and rescue right over the next ridge if necessary, because of course they would be going back one day. Watching her suffer, a beloved friend, unable to do anything, they had suddenly realized how alone they were, how limited, that one by one they would all die in one way or another and in some future years there might be no trace left of them at all. And as if each of them had come to the same understanding as a group through that incident, also the idea that traveling back home, or even communicating with their home planet, was unlikely to happen, in their lifetimes, if ever. But they were so few, down to twenty-seven now, and to send anyone off into the wilderness was simply to suffer another loss. Three children had traveled with them, and no doubt there would be more, but it would be ages before there were enough of them to spare a small group to travel and start charting the area beyond their small valley. They were scientists, had been trained for this and had brought their instruments, but plain old survival took more time than they liked to admit. They had decided not to hunt animals because of the risk, but still all of them really needed to search and gather, and cook and preserve food, and make and mend clothing, not to mention the nightly challenge of attempting to communicate with equipment that didn’t work well in this climate and needed maintenance they could barely provide. She knew that her not-so-long-ago ancestors had lived like this, and while she had known their life was difficult she had never realized just how difficult, how fragile life itself was. Her confidence—no, arrogance—as a scientist had led her to think her race would never have to endure that again. She wondered how her ancestors had ever managed to not only survive but flourish and accomplish things not found anywhere else in the universe with these everyday challenges of just getting enough food to eat. Though everyone doubted now that anything resembling civilization existed here, they had gladly given their friend what he felt he needed and sent him off, not expecting to see him again but secretly hoping he would somehow find civilization and bring it back to the valley. He had returned, however, just a short while ago, followed by three, well, were they people like themselves? They looked half animal with an abundance of hair and no spoken language, but they walked upright and wore rudimentary clothing, their hands were strong and dexterous using tools they had made, and they had wordlessly led members of the group around to various plants and shown them what to do with them. Although the learning curve had started quite high, they had quickly discovered the point was valuable foods and medicines beyond the capability of their own scientific equipment brought for the purpose. They did their best to express their gratitude and set up travel and communication between their two living areas, exchanging members to live in each others’ groups. The sunset colors had reached their peak of brilliance as the sun passed behind strips of dark purple cloud edged in glowing gold, rays of light reaching upward and downward in pink and yellow, trees, rocks and the grass on her outlook glowing with the coral of the deepening evening. She waited until the sun was halfway below the horizon to the west, then turned and looked above the horizon to the east, and there it was, glowing red against the vivid deepening cobalt of the eastern sky. She’d also noticed this the night they’d arrived, like a welcoming beacon, and the clear view of it was one of the reasons she returned frequently to this spot. It seemed to pulse, signaling perhaps. It was home, the fourth planet from the sun, the planet they’d left a little over two years before, traveling by the craft that had been built for the purpose of interplanetary travel, though their trip had been somewhat extemporaneous. That first night she had wondered if the pulsing red glow was the holocaust they had left behind still burning, the populations of their race killing each other in a misbegotten firestorm they had barely escaped, or to be honest, had simply run from. If so, the place was still burning. The ship had stood stocked with medical supplies, food and clothing, oxygen, water and all else that would be needed during the someday trip to the third planet with the climate so like their own. It was opportune that they who had designed and built the ship and trained to pilot it were all stationed conveniently close, and by their position had been closer to their government’s plans than others as well. They had guessed that this annihilation was a possibility. In the last few days when, despite the rhetoric that negotiations were ongoing, these leading scientists could see the missile silos being prepared for use. They passed the word among staff to get families together, pack what they could and get ready to leave if necessary. Was it selfish to save their own and use their training to take the chance on flying out, hoping they weren’t hit by a missile, and getting above the atmosphere before it became too toxic, the air polluted with radiation, carbon monoxide and debris unusable to convert to hydrogen fuel? Or was it reality that they would be the most likely to survive it if they undertook this mission and, because of that, because someone should represent their race in this universe, they should. So they had followed the mission they had trained for, watching their planet glow with outrage until its atmosphere was so clogged with smoke and debris that they could no longer see it as they silently moved farther and farther away. They traveled without incident and landed safely in the northern hemisphere of the planet, avoiding the huge sheets of ice that blanketed the north and south poles of the planet. From studying this planet they knew the spot they landed would have been a fertile plain surrounded by low mountains and several bodies of water, safe for landing and easy for travel, perhaps rich with food similar enough to their own that they could move right in. Of course, they had no intention to stay. Each night they signaled home base, never receiving a response which was something they had, somehow, never expected. They had planned to go back as soon as possible, even if only to see the destruction, but as time wore on they could see now that maintenance to the ship, fuel, food…so many things stood in the way that instead of months, it might be years, or generations before anyone could go back. Perhaps none of these travelers would ever know the outcome of that horrible war. How strange to go from the seeming omniscience of constant, instant communication and information to this mocking silence. She watched as her home planet glowed ever more brightly in the deepening sky, pulsating slightly with the beat of her heart. As it rose above the horizon and the night sky deepened, the little planet was soon surrounded by stars in their familiar constellations. They had survived almost a year here, had made contact with natives, had built a society and would someday have children of their own no doubt. Soon they planned to begin growing edible native plants rather than gathering what they needed and possibly to attempt to domesticate a few animals that resembled those from home. They’d build small towns and the struggles of power and desire would emerge, and only time would tell if they had also brought with them the potential to destroy this civilization, too, or if they had left that potential behind in the lifeless destruction on that beautiful, glowing red planet. This story began to build itself far back, when I was still in college and reading Omni magazine, enjoying the futuristic science fiction of the late 70s and early 80s. It was to be my first novel, and I began writing in earnest immediately after graduation, dreaming of continuing on with my Master’s degree. But life caught up with me and family issues took the time I’d carved out for writing, and I lost touch with the energy to write an entire novel. I carried the beginning draft for years, occasionally rewriting it, then in 2010, when I took the photo of the evening star which I used to illustrate this story, I decided that nothing would stop me from at least writing a short story, and so I did. As with most of my creative writing I let it sit for a while, tortured it with rewrites a few times, let friends read and critique it, and finally deemed it ready for publication, at least on my own blog. 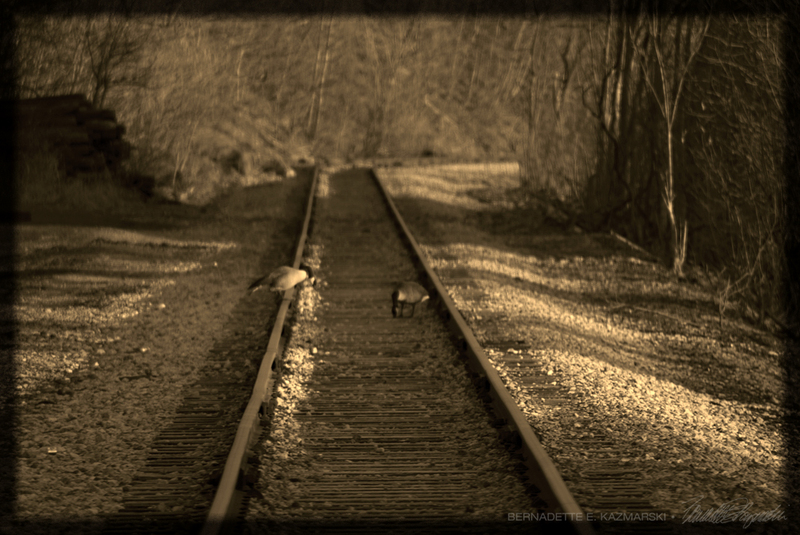 I remember when we courted, when I would sneak down to the tracks by the creek right after dinner, just around the bend from where my parents were settling down for the night, and wait for you. My heart would skip a beat when I saw you there, waiting for me, I almost flew to your side but thought I should be careful, not knowing you all that well, yet each time I saw your silhouette my love was stronger and I knew you were the one. And what silly things did we do but talk about the weather, and what we’d done that day, and what our siblings were doing, and circle around each other and peck at the gravel as if the world hadn’t suddenly stopped turning because we were together. 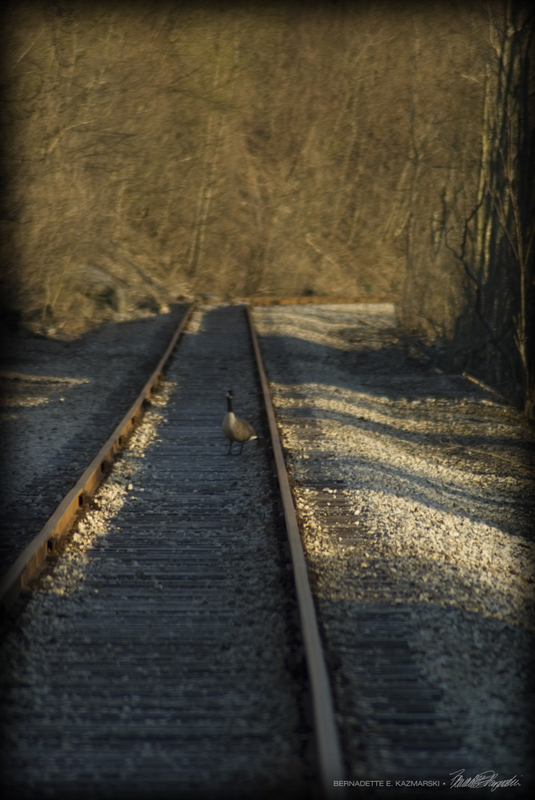 Just a few minutes, we never wanted to draw attention, but when I saw the shadows creeping farther and farther across the tracks I knew I had to start back for home to be back by dusk. Who would think, all these years and all these children, and I still carry these memories of you walking to see me in the warm evening light. I composed this photo story for a weekly writing challenge, “Five Sentence Fiction”. 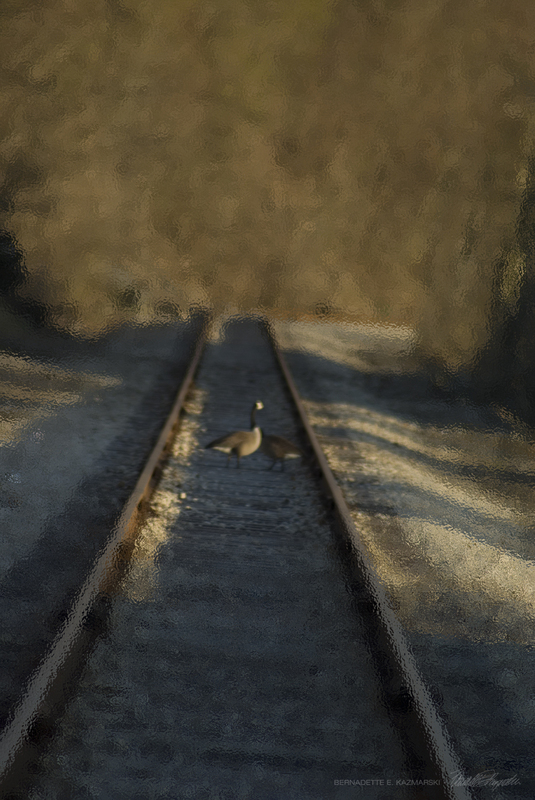 I took this series of photos walking on Main Street one spring evening recently, where the tracks cross the street and run along the creek where I walk nearly every day, and yet at the right angle they look completely isolated from civilization. 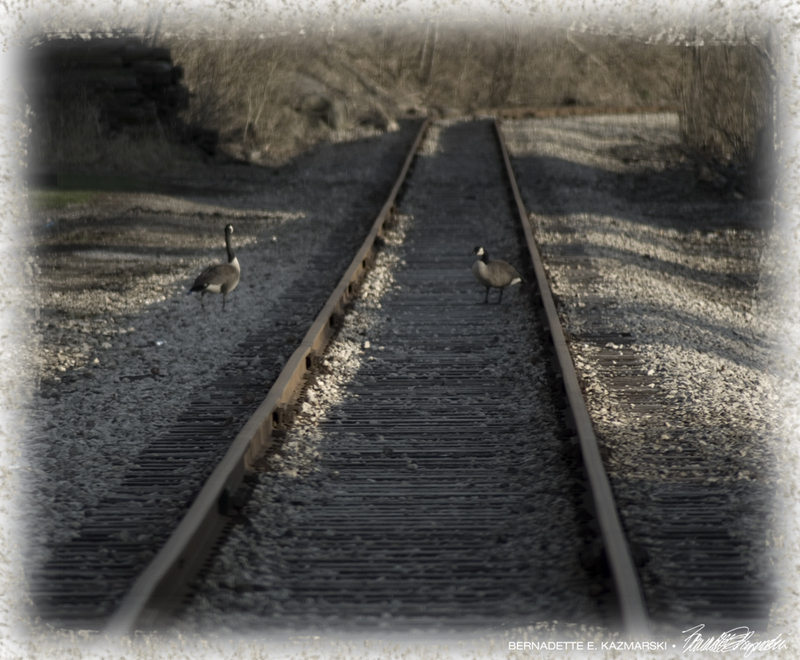 I saw the one goose, then a female came to meet him—at a distance I can only tell them from one another by size when male and female are side by side—and they looked and acted so much like a couple of awkward teenagers. 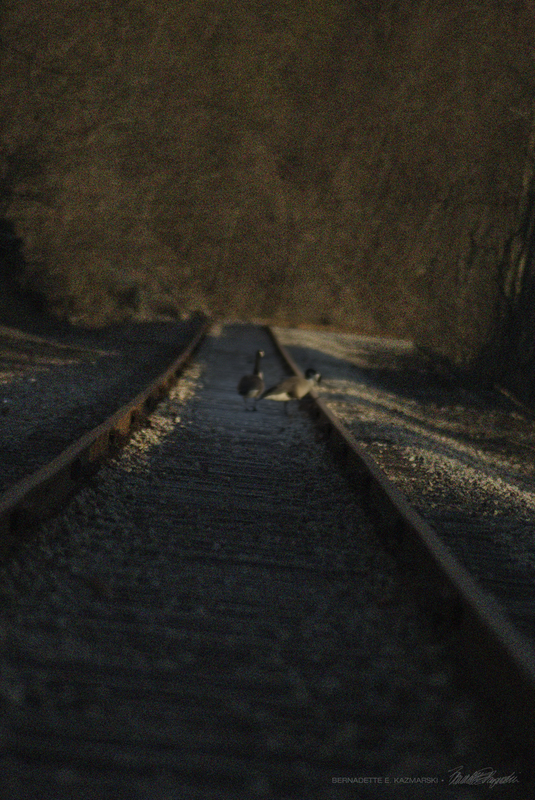 I used my 70-300mm zoom lens so I could focus on them and give a little blur to the surroundings; unfortunately in the light it was difficult to see if I was focusing on the geese and in some photos I was focusing on the tracks just in front of them. No matter, I saw a story right away and knew I could even use those photos. The evening light gave the scene an antique look. Then I waited for the keyword that would work for them. I’ve been short of short stories here since I set up this site earlier this year. I haven’t had quite the time to write as I had hoped so I’m going to share a short story I wrote last year that I’ve been holding to post when the time seemed right, to help make up for that lack and because the season and time are right for this story. I spent some of those precious 24 hours thinking how the heck I was going to be believable in writing about being on a boat on the ocean when I didn’t feel I could imagine it clearly enough, and decided I’d focus on being in the ocean or on the beach, which I could imagine. 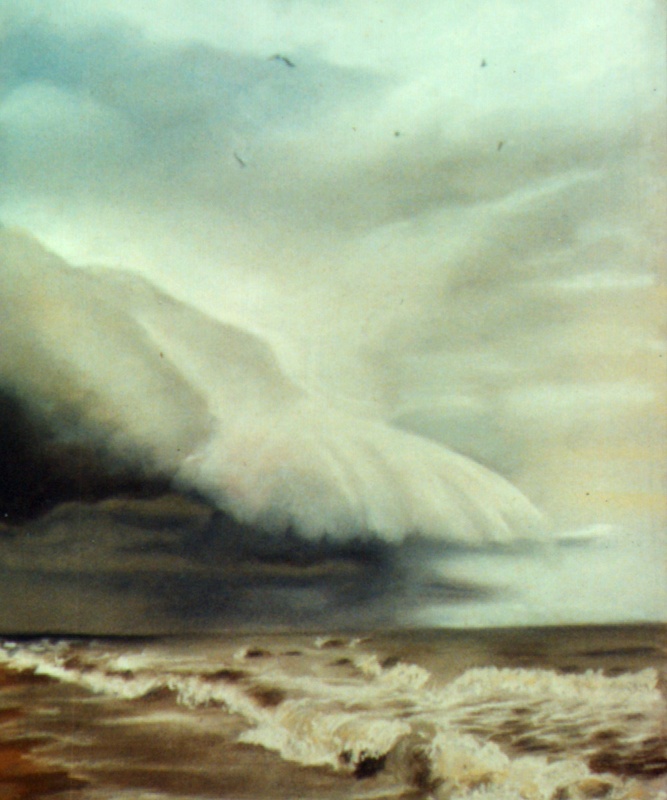 Quickly I leaped to painting, and then to the painting I included here, one of mine from 1993 after my one and only visit to the beach at Chincoteague Island, VA, as my inspiration for why I was on a boat on the ocean. As I wrote, the whole idea of the painting itself, the painting contest and even falling asleep, just fell right into place because I knew I’d easily fall right to sleep after being out in the sun on the beach painting for the morning.